Can Any Exercise Make You Grow Taller? Kathy Root is a Certified Personal Trainer and Precision Nutrition Coach-based in Huntington Beach, Calif. She holds a bachelor's degree in health behavior science and strength and conditioning. Exercise can do many things to improve aesthetic appearance, but it does have its limits. Some exercise methods may claim to "lengthen" muscles and create "long and lean" bodies, however your genetics have the ultimate control over your height. Fortunately, there are indeed ways to improve your body's posture and alignment through exercise, creating the illusion of a taller version of yourself. Good posture can do wonders for your appearance. Take a moment to stand up tall, relax your shoulders back, and you'll likely notice that you feel taller and maybe even a bit more confident. Unfortunately, most people today spend the majority of their lives sitting, whether it is hunched over a desk at work or lounging on the couch at home. Over time, these habits can result in postural deficiencies and tight muscles, preventing you from achieving that long and lean appearance that comes with proper alignment and good posture. The spine has a natural curve to it -- a slight backward bend in the neck and lower back, and a slight forward bend in the upper and mid back. Some of these curves can become exaggerated or even flattened and may cause pain and tightness in the body. Two of the most common postural deficiencies are excessive kyphosis -- resulting in a forward head position and a rounded upper back -- and excessive lordosis -- resulting in a hyper-extended low-back position. Correcting alignment and posture can improve these deficiencies, resulting in a taller appearance. Yoga and Pilates are two examples of exercise practices that focus on proper alignment and breathing techniques. Proper breathing is an often-overlooked component of exercise that plays a valuable role in helping muscles to relax, allowing you to stretch deeper into poses and ease tension in the body. 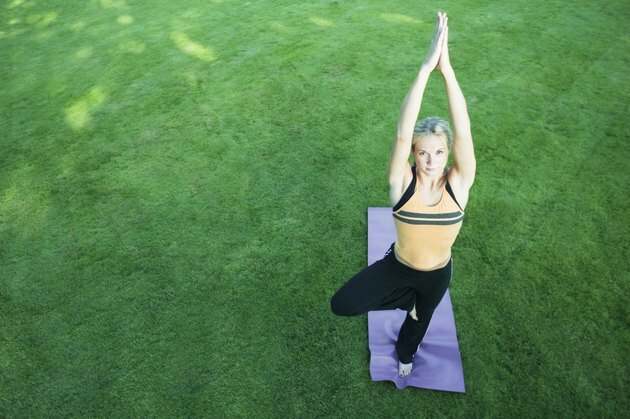 Both yoga and Pilates incorporate movements that strengthen the core, which can also contribute to better posture. While these exercise practices do not technically "lengthen" the muscles, they do teach you to become more aware of your body and how you carry yourself, both inside and outside the classroom. If you find yourself sitting for most of the day, try setting an alarm for standing or walking breaks and take a moment to stretch before sitting back down. Become more aware of your posture and note if you tend to round your shoulders forward. Try incorporating mind-body practices such as yoga and Pilates into your exercise program, beginning with two to three days per week. Consistent practice will help you achieve that "taller" version of yourself.